On the fourth day of Christmas I bring you Turkey & Tradition, a dark tale from Louise Jensen, author of three novels, the most recent being The Surrogate. Again, I drive my spade into the frozen ground. Tiny rockets of pain shoot through my wrists, up into my shoulders. Tears spring to my eyes and I tell myself it’s frustration, pain, anything but this horrible sense of missing you. I drop to my knees, the coldness seeping through my jeans, and I burrow at the earth with my gloved fingers but the mud is as solid as the gold band I still wear on my wedding finger. I look up at the fir tree, branches dusted with snow and my heart aches. We’d brought this tree inside every single Christmas eve; you were big on traditions. Mulled wine warmed on the stove, the house smelling of cinnamon and cloves, as you’d heft the tree into its usual place, standing tall and proud in the dining room. You’d twist lights around its middle – a man’s job – you’d say, and then I’d hang baubles and candy canes. Three tiny felt stockings for the children we’d longed for but were never blessed with. Now you’re gone too. Loneliness wraps itself around me like a second skin. I raise my eyes to the flat, white sky and scream out my frustration, my breath billowing in front of me like a cloud. I wonder if you’re looking down. I like to think you are. Despite my protestations, my sister’s coming for Christmas dinner this year. We’re going to have roast beef the way we always had growing up. Dad was a butcher and always insisted on something ‘with a bit of blood in it.’ You’d been horrified. ‘It must be turkey. It’s traditional.’ I still feel fragile. Raw. It’s too soon for snapping crackers and flaming puddings, carols about peace and goodwill to all men, but ‘it is the season for families,’ my sister insisted. She’s bringing Sophie my niece. ‘It will be odd without Dan at the table.’ She had said. Grief shimmering in her eyes. She adored you, as did Sophie and you were so good with her. Every visit I got a glimpse of the father you could have been and a painful lump rose in my chest. Sometimes I’d pretend Sophie was ours. She had the same colouring as you. You’d stretch in front of the open fire, her cradled in your lap, reading stories about big bad wolves and too-hot porridge, heads bent, blonde hair glimmering as the flames crackled and hissed. She could almost have been ours I thought as I toasted pink marshmallows brown. Almost. I still remember the heart wrenching pain when you’d told me you were leaving me for my sister. I still remember the weight of the iron in my hand. The sizzle as it hit your face. The sickening crack as your head hit the flagstone floor. I do hope the blood doesn’t stain. I’d told everyone you’d run off with your secretary. I almost felt sorry for my poor sister as I watched confusion, disappointment, anger slide across her perfect, perfect face. She believed me. Why wouldn’t she? After all I’m not the liar here. I sit back on my heels. It’s no good. I can’t indent the earth at all, let alone dig a hole big enough to bury you in. No matter. I’ve a batch of pastry resting in the fridge and mince pies were traditionally made of meat weren’t they? You’d appreciate the tradition. I’ll get dad’s old mincer out of the garage. You’ll be joining us at the dinner table after all, darling. Oooh – told you it was dark! Thanks so much Louise for that tale. Anyone fancy going to her house for Christmas dinner?? Now read on for some more about Louise and her books. Louise Jensen is a USA Today Bestselling author who always wanted to be a writer when she grew up, and when that didn’t happen she got a ‘proper’ job instead. Several years ago an accident left Louise with a disability and she began writing again, to distract her from her pain and compromised mobility. But writing turned out to be more than just a good distraction. Louise’s first two novels, The Sister and The Gift, were both International No.1 Bestsellers, and have been sold for translation to sixteen countries. The Sister was nominated for The Goodreads Awards Debut of 2016. 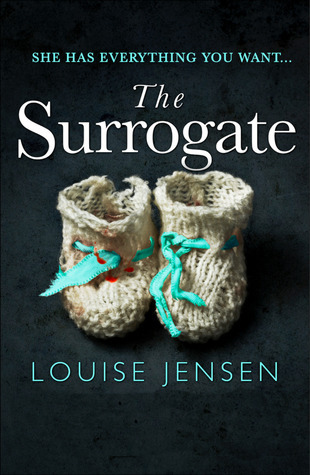 The Surrogate is Louise’s newly published third psychological thriller. Me too. Made me laugh and I’m sure it shouldn’t have! Both books sound fab and such an inspirational back story for how they came about.